Greg Proops kicked off his three-day stand at Toronto’s Comedy Bar last night, teaming up with his Whose Line Is It Anyway? 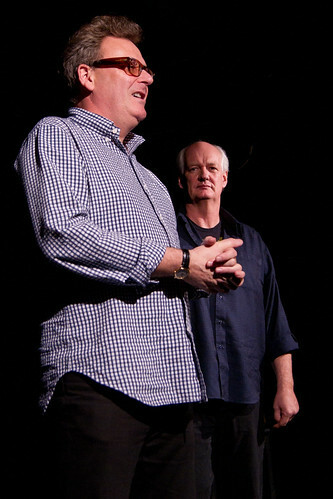 castmate Colin Mochrie to “kick everyone’s asses” in the weekly Catch 23 improv competition. At least that’s how the Facebook invite billed it. Seems like a pretty sure thing, right? The other teams were no slouches (Bob Banks and Gary Rideout Jr. competing as The Movie Twins, and Kurt Smeaton and Kayla Lorette as Perfect Night), but certainly, nobody was going to beat two of the most famous improvisors in the world. The problem is, you can’t plan improv. The Catch 23 format is a four-round competition between three teams. Each team is allowed a total of 23 minutes to complete their four scenes, and is given a score for each scene. Half of the score comes from the audience votes, and half comes from that night’s judge — in this case, Norm Sousa of the Sketchersons. The scores were kept tight in the first half, and everything was going according to expectations. 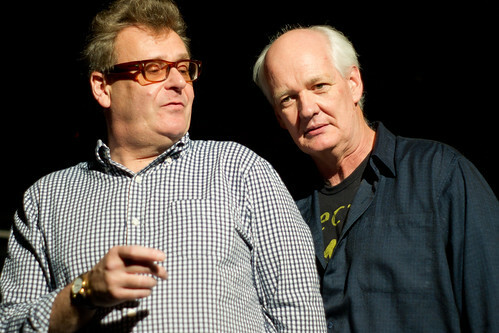 Proops and Mochrie delivered a scene about two undertakers who ended up in a brief argument about a seemingly accordion-style casket. Yup, that’s how it’s done. Even after Proops insulted Sousa’s sweater, the scores were high. It wasn’t until the third round that everything went off the rails. After a back-and-forth that revealed Ford’s penchant for eating mayonnaise while masturbating, the newly-coined nickname “Mayoraise” left Halloran and the audience laughing to the point of near-tears. Banks and Rideout were given the suggestion of the gay pride parade, which became a scene about two different sponsor floats. It’s safe to say it didn’t go particularly well. But anyone who knows Rideout knows that he doesn’t care much for on-stage failure, and he demanded they get a mulligan on the scene. The audience gave a new suggestion of “wrestling”, and Rideout left Banks on stage to stall while he sprinted out of the theatre for reasons unknown. He returned dressed head to toe in John Cena fan gear, which he just happened to have with him (lots can be said about that). What followed was a four-minute advertisement for a community centre solitaire tournament, in the style of WWE trash-talking interviews. It was a beautiful redemption, but not enough to keep them in the running. The team of Smeaton and Lorette cemented their position as the main contenders when they were given the suggestion of “the 1%”. Smeaton mimed video game playing, and exasperatedly delivered the blackout line “oh, I just crashed an actual plane”. Nothing further needed in that scene. That meant they were left with nine minutes for their final scene, an eternity by Catch 23 standards. But they left the audience stunned by creating a fantastical world of magic and potions and good and evil. It the designation of “best Catch 23 scene ever” from Sousa and a perfect score, technically putting them ahead of their celebrity rivals at the end of four rounds. It was a fascinating conundrum. Sousa called for a 90-second playoff round between Smeaton/Lorette and Proops/Mochrie, in a veiled effort to stick to this show’s original narrative. But it was too tough to justify anyone other than Smeaton/Lorette as the victors. On to the second show of the night: MANTOWN, the improvised frat party. 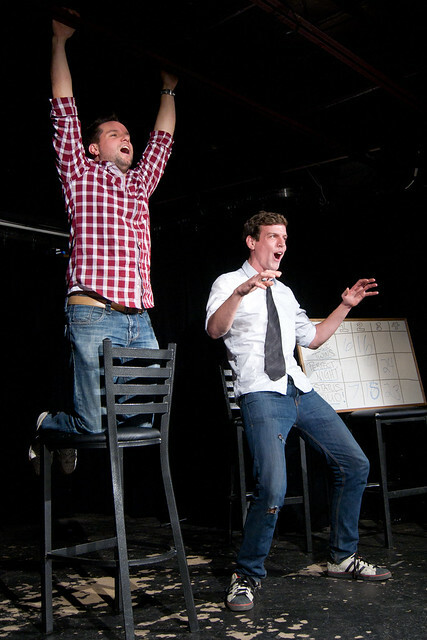 Drinking games and improv; what could be better? 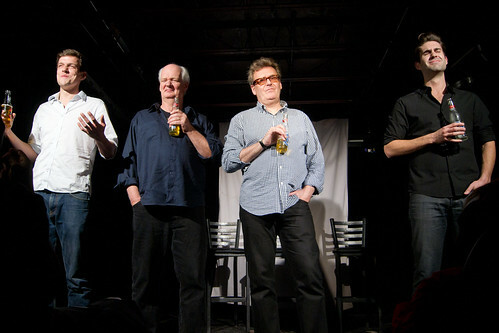 After an all-female opening group (who I hope called themselves Ladyville, or else my memory has failed me) attacked the stage with vaginally-inspired scenes (true: tree bark can haunt your ladybits), Proops and Mochrie returned to play with the boys (Bob Banks, Adam Cawley, Rob Baker). Driving to a party, fighting about Journey, and Mochrie carving a guitar out of soap… it was over way too fast. Or maybe we just blacked out from the drinking games? Proops is back at Comedy Bar tonight for two standup sets, and tickets will be available at the door. 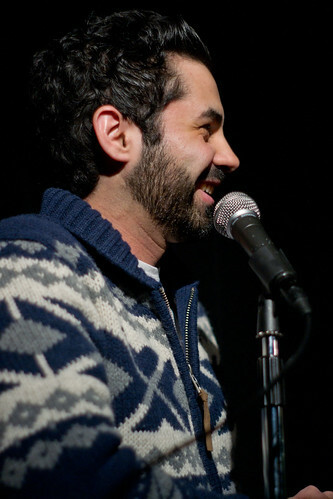 Visit www.comedybar.ca for details! All photos copyright Sharilyn Johnson.